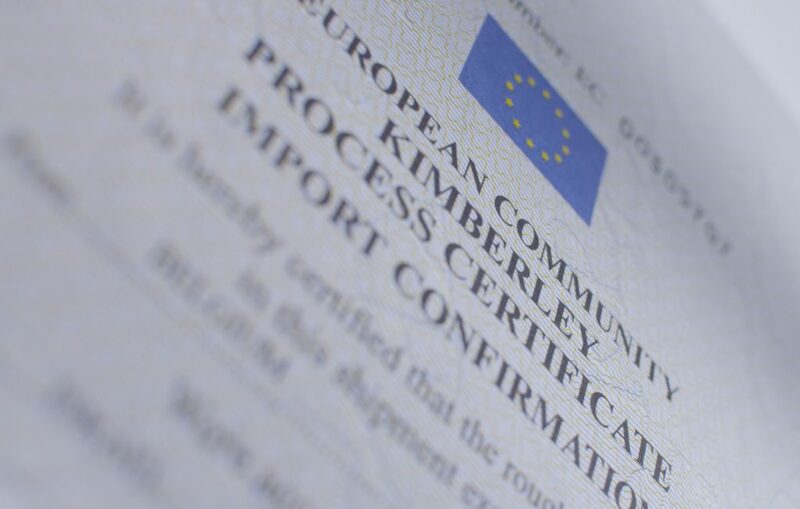 The Kimberley Process Certification Scheme (KPCS) imposes extensive requirements (*) on its members to enable them to certify shipments of rough diamonds as ‘conflict-free’ and prevent conflict diamonds from entering the legitimate trade. Under the terms of the KPCS, participating states must meet ‘minimum requirements’ and must put in place national legislation and institutions; export, import and internal controls; and also commit to transparency and the exchange of statistical data. Participants can only legally trade with other participants who have also met the minimum requirements of the scheme, and international shipments of rough diamonds must be accompanied by a KP certificate guaranteeing that they are conflict-free. The Kimberley Process is chaired, on a rotating basis, by participating countries. So far, South Africa, Canada, Russia, Botswana, the European Union, India, Namibia, Israel, the Democratic Republic of the Congo, the United States of America, South Africa, the Republic of China have chaired the KP, and Angola is the Chair in 2015. KP participating countries and industry and civil society observers gather twice a year at inter-sessional and plenary meetings, as well as in working groups and committees that meet on a regular basis. Implementation is monitored through ‘review visits’ and annual reports as well as by regular exchange and analysis of statistical data.